A friend of mine came here 6 years ago. He arrived in this academy as a little boy and left as a man. He just stayed a few months in the academy, but it was enough to help him build the man he wanted to become. He talked to me about the discipline, the Masters, the training…and I really had to try it by myself. And it was a good way to discover China from the inside,then,we go to kunyu mountain academy. There is a really good mentality in the academy. I didn’t feel judge by anyone. At the opposite, I’ve been listened and help by everyone, students, masters, translator and the school’s doctor. There is some kind of family’s feeling between everyone. I came here with my boyfriend and he really supported me and helped me a lot too. And I don’t know how far this place really made our relationship stronger. To be brief, I would say that my three months here looks like one really short month! I’ve never been bored of being here and I really didn’t want finish journey. 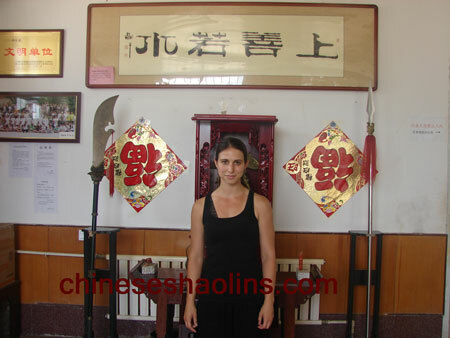 The Kungfu Shaolin experience brought me an much as the outside (like physical aspect) than form inside. I’ve learn to know my body and to listen to him to practice the basic of Kungfu and this is a perfect way to begin with Martial Art and to continue it once I get back home. Thanks for the training, the healthy way of life and especially to the doctor. I really feel in a better health now than when I arrived. So yes, the physical aspect in huge. And it’s the same for my mind. The Qigong, the massage, and the free time to walk in nature, as well as the social life here, really helped me to build the person. I want to become, I have learn how to let it go and just appreciate the moment! I’ve overcome my mental and physical limits in a good way. Because I really feel guided by the Master (and especially my Shifu). I will really keep this experience in my heart! I really want to thank the translators who have always been there help me! And the master, especially my master for patience and his way of teaching things to us.This is a really nice area. The national park and the temple and so great .